Want to discover how to share the solution they want and need in terms they understand? 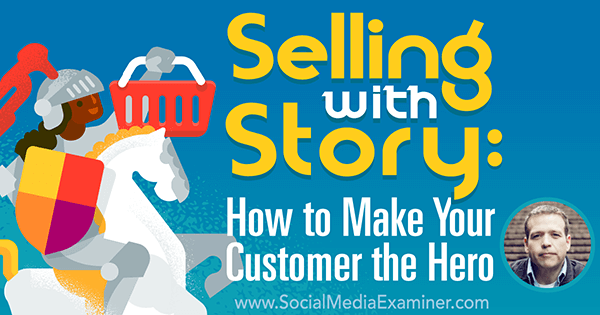 To explore how to connect with your customers through story, I interview Donald Miller. In this episode, I interview Donald Miller, a story for business expert. He’s CEO of StoryBrand, which helps businesses clarify messaging via workshops and consulting. Donald also hosts the Building a Story Brand podcast. Donald has helped more than 1,000 businesses improve their messaging. Donald explores how story is used to sell, and today you’ll discover Donald’s seven-part story framework. 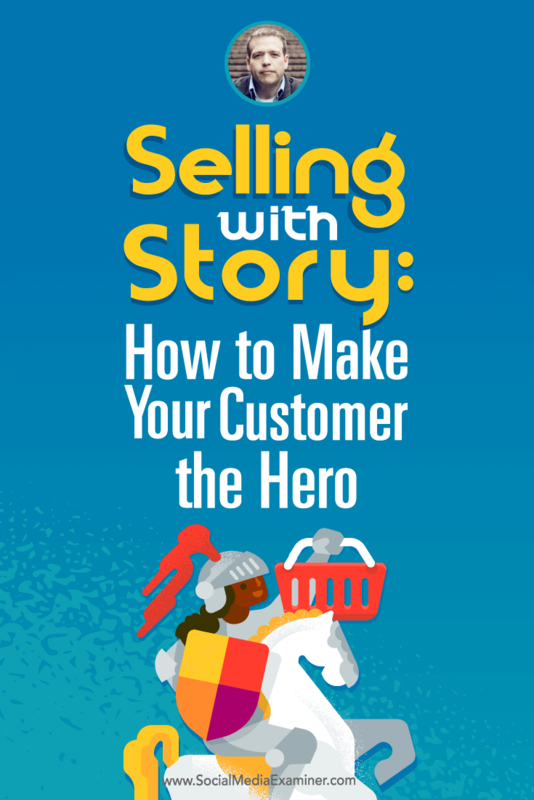 Listen as Donald Miller shares what marketers need to know about selling with story, and how to make your customer the hero. Donald had a successful career writing memoirs. Before that, he ran a publishing company. Essentially, his business background got hijacked by his writing career. When he went back into business, he started a conference company. Although he sold millions of memoirs, not many people attended his conferences. Donald figured out the conference invitation was too vague. His message was not pointed, understandable, or accessible. It didn’t hit a perceived need, so nobody could figure out why they should come. Donald needed to simplify his message so people would say, “I need that. I’m going to show up. I’m going to buy it.” To do that, Donald created a framework based on the elements of story. Since he studied story to write books and screenplays for more than a decade, he knew story was the most powerful tool to compel the human brain. He took the seven most popular elements in every story, the seven things that happen in Tommy Boy, Star Wars, Bridget Jones’s Diary, The Hunger Games, Moneyball, and The King’s Speech, and put it all on a whiteboard. Donald discovered how to filter his marketing messages through this seven-part framework. Donald took the elements of story and put them into a marketing framework. Applying this framework, the conference grew from 350 people to 970 people to 1,200 people to 2,000, through word of mouth. People finally understood what he had to offer, Donald says. This evolved into StoryBrand. They let the conference company go because StoryBrand took off from there. Donald has worked with more than 2,000 companies, helping them clarify their message. They all struggle with the same thing. They don’t know how to talk about what they do, since they’re too close to it. Story is based on 2,000-year-old formulas that have been refined over time, Donald explains. And story is tested every week at the box office. Story, like music, is formulaic. The difference between music and noise is formula. Since story is such a powerful tool, Donald realized it’s useful to clarify marketing messages. There’s no benefit to a business getting its story out. Customers only care about their own stories. StoryBrand helps people understand the story that their customer is living and what role their business needs to play within that story. Listen to the show to discover which companies and people use story and get responses. Why is story so powerful? Donald says that’s a question that people like Christopher Booker, Robert McKee, and Joseph Campbell have all tried to answer. Donald thinks story comes from within. People self-identify as the hero in a story that’s trying to accomplish something and overcome challenges. Every human being is designed to see the world as an adventure. People believe intuitively that some things come together that would create a climactic or obligatory scene that will resolve the conflict in their life. These are well-worn paths in the human subconscious. Story is more or less shining a light on or creating metaphors for those paths. Listen to the show to hear about how story is universal. Donald goes through the seven-part story framework. 1. Know what your customer wants. If you want to invite customers into the story, the first thing you need to do is define something they want, as it relates to your brand. The mistake most companies make is they either don’t define what their customer wants (it’s not easy to understand) or they define 33 things their customer wants. For example, if 12 minutes into The Bourne Identity the audience still doesn’t know exactly what Jason Bourne wants (that he has amnesia, somebody is trying to kill him, he has unique abilities, and he doesn’t know where he got them), they’re going to walk out. In the case of many companies, Donald goes to their website and can’t tell what they think he wants. It’s not clearly defined since they sell 33 different things. If in The Bourne Identity, Jason Bourne wants to know who he is, to marry the girl, to run a marathon, to lose 20 pounds, and to adopt a cat, the audience will walk out for the opposite reason. A business needs to define what the customer wants and make it very clear, compelling, and memorable. That means a lot of stuff hits the editing room floor. For example, Donald just finished a private workshop for a company called LibertyID. When they came to Donald, they thought they were competing with LifeLock and other companies that offer online monitoring for identity theft. Their problem was people can basically get online monitoring for free. Plus, online monitoring doesn’t work, because when they tell you, it’s too late. LibertyID offers monitoring, but also when someone’s online identity gets stolen, they handle it. The average person whose identity has been stolen spends 300 hours on the phone trying to clean it up. The average person who pays LibertyID every month (which is between $20 and $40 per month), spends 1.5 hours on the phone with a LibertyID rep, and their reps get on the phone and take care of it for them. They were positioning themselves as an alarm company but were actually an insurance company. Now that LibertyID changed their messaging, they’re seeing growth. What does the customer want? Do they want monitoring? No. They want to prevent the hassle of identity theft and avoid having to go through the torture of cleaning it up. 2. Define the three levels of problems: external, internal, and philosophical. When you define what customers want, you also have to define a problem that will get in their way. There are three levels of problems in story: external, internal, and philosophical. Companies tend to sell solutions to external problems, but human beings buy solutions to internal problems. Define the levels of problems your customer is experiencing. For example, the external problem of your identity being stolen is, of course, your identity might be stolen. The internal problem is the frustration that’s going pause your life and affect your family, financial stability, credit rating, and status in society. Those are all internal problems. Companies need to understand that people are walking through their door to resolve more than physical problems like their lawns need mowing, their pipes need fixing, or getting rid of pests. Those external problems are causing them a sense of frustration, self-doubt, fear, jealousy, and envy. Something else is motivating them to call you. When you can identify what that is and talk about resolving that frustration, tension, and self-doubt, you see a much greater response. The external is the physical problem, the internal is the way that problem is making people feel, and the philosophical is why that’s wrong. For example, in Star Wars, Luke Skywalker’s external problem was the Death Star, the existence of the evil empire. His internal problem is he doubted whether he had what it takes to be a Jedi. The philosophical problem is good versus evil. In the obligatory or climactic scene of a movie, if you can resolve the external, internal, and philosophical problems in one shot, a little bit of serotonin seeps through your audience’s amygdala and they have a sense of pleasure. It’s a powerful resolution to three levels of problems in one shot. When Luke shoots the photon blaster through the Death Star and it blows up, the audience goes crazy. Same thing happens when Daniel in The Karate Kid lifts up his leg and looks like a flamingo and kicks the other guy in the face and wins the karate tournament. External problem: he wins the karate tournament; internal problem: he knows he has what it takes; and philosophical problem: good guy beats up the bully. When a brand can position the purchase of their product (the Buy Now button) so customers know they’re about to resolve external, internal, and philosophical problems with one action, they’ll create raving fans, brand evangelists, and passionate followers. They’re solving internal, subconscious, narrative loops. Apple, Chick-fil-A, and Coca-Cola have all done it. 3. Position yourself as a guide. In most stories, a secondary character enters. There are a number of names for this character, but Donald calls this character the “guide.” These are Yoda and Obi-Wan in Star Wars, Haymitch in The Hunger Games, Peter Brand (Jonah Hill’s character) in Moneyball, and Lionel in The King’s Speech. In a movie, if the hero could resolve his or her own problem, there wouldn’t be a problem in the first place. There’s something missing in their lives that won’t allow them to solve it, so they need a bit part to come in and help them along the way. The guide is a powerful tool in a movie. Donald tells clients to always position themselves as the guide, never as the hero. Every customer self-identifies as a hero. When companies tell their stories, they subconsciously compete with the ego identity of the very person to whom they’re speaking. People don’t buy products from brands that position themselves as the hero in the story. They buy products from brands that think their customers are heroes and give them the tools they need to win the day in their own stories. 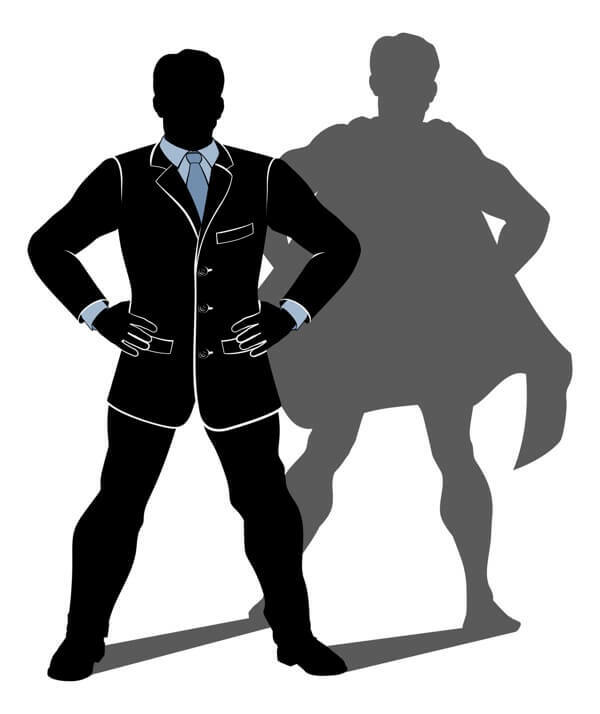 Guide the customer to become the hero of his or her own story. When you put other people’s stories before your own, you’re richly rewarded for it. Jim Collins talks about this in Good to Great. It’s the key to everything. There are two things that position you as the guide: empathy (you care about and resonate with customers) and authority (competence). Some people, such as Jonah Sachs, author of Winning the Story Wars, warn about having too much authority. The next generation is looking for a brand to put its arm around them and be their friend. Donald says Jonah has a point. If you come across as too authoritarian, you may scare people off. However, if you need to lose 30 pounds and you go to a nutritionist who says, “Me too,” you’ve gone to the wrong nutritionist. You need someone who knows what they’re doing. Your story is relevant if you have a backstory of pain, failing in this area, and you figured it out and are now winning. That’s different. That story gives you authority, resonance, and empathy. For instance, the only thing you need to know about Yoda in Star Wars is he used to be a Jedi who struggled and figured it out. Now he can help Luke. 4. Give them a plan. Now, the guide gives the hero a plan. Luke has to fly into the trenches and shoot the photon blaster through the Death Star. Katniss needs to endear herself to the public to get more sponsors so she can have resources to win the Hunger Games. The plan is what bridges the gap for the potential customer. For whatever reason, the fact that someone gives three steps dramatically increases the chances you’ll buy from them. The human brain is drawn away from confusion and toward clarity. People don’t want mysteries in their brain. If there’s a mystery and they can’t bridge the gap on how to buy this insurance, they tend to walk away. Imagine your customers are crossing a big creek. Your plan is stones in the creek that they can walk on. When I ask if doing this is manipulative, Donald explains it’s only manipulative if you’re lying. If you’re leading people to a product that’s going to help them and change their lives, it’s not manipulative. If people don’t need your product, if you’re not resolving a problem for them, you have a bigger issue than a story or marketing problem. You have an ethical problem. So, Donald says, if you’re using this formula to manipulate diabetics into buying sugary foods, shame on you. All this formula does is create clarity. Plus the more plans the better. You can have a plan for creating a plan. Give your customers detailed steps to follow. The idea is to break down what you’re already doing into bite-sized chunks that people can wrap their minds around. For a conference, even something as simple as “register, choose a hotel, and show up on the day of the event” works. People are bombarded with 3,000 commercial messages a day. 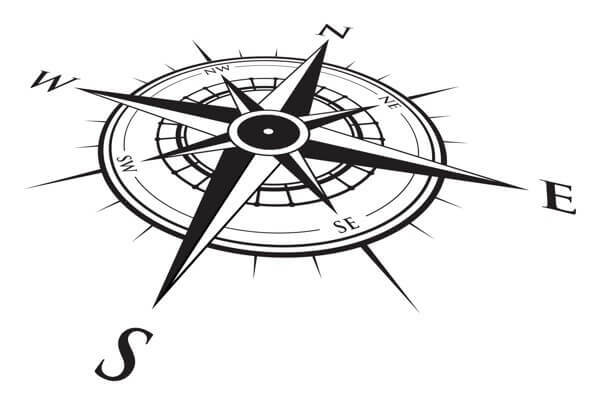 People will always choose the brand that communicates the clearest, regardless of whether they have the best product. There’s one brand of Pop Tarts that literally says, 1. Open the Pop Tart, 2. Put it in the toaster vertically, and 3. Enjoy. While this may seem absurd, they probably sell more Pop Tarts. 5. Call them to action. If you don’t ask your customers to buy from you, they won’t. There has to be an obvious Buy Now button on your website. Plus your email blasts should tell customers exactly what you want them to do. It should never be a mystery. Your call to action should always be clear. There’s the direct call to action and the transitional call to action. Donald says there should always be two. The direct call to action is Buy Now. The transitional call to action is, watch this video, download this PDF, read this white paper, or take another step on this journey. The last two steps are success and failure. The call to action has to result in either a happy ending or a sad ending. You also have to tell them what life will look like if they don’t buy your product. If they don’t buy your product, they will have to spend 300 hours on the phone, their lawn is going to look terrible, and their pipes are going to leak this winter. No stakes in the story means there is no story. You need to give your customers a vision of what their life could look like if they use your product. Many businesses don’t do that. Those are the seven elements. A character who has a problem and needs a guide, who gives the character a plan and calls him or her to action that either ends in success or failure are components of almost every story. This is the way the human brain works. In Donald’s opinion, if everything you communicate through words and images (tweet, post on Instagram, put in LinkedIn, put on Facebook) isn’t coming from one of these seven buckets, you create noise and confusion. Your customers will walk away and go to a competitor who offers clarity. Listen to the show to hear more examples from Donald on how story works. It can be a hassle to figure out who are the most engaged people in the Facebook group you run for your business. Grytics is a great tool to analyze your Facebook groups. 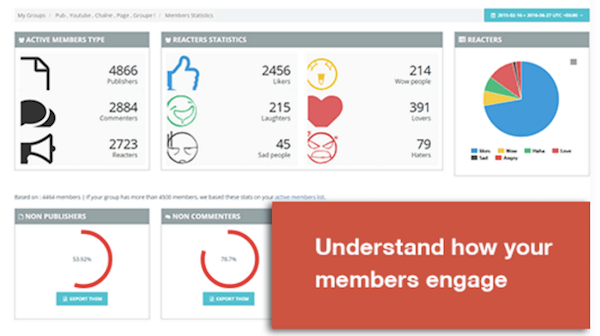 Grytics gives you statistics based on your most active members, engagement and activity scores, plus you can see which were the top posts in your group. It’s a desktop tool. Go to Grytics.com. There’s a free version, which allows you to get a bunch of basic data. Then it moves up to Premium, Pro, and Enterprise. And each of those is only a small step up – $12, $25, or $55 per month based on features. Listen to the show to learn more and let us know how Grytics works for you. Let me explain what it is and how it works. The Social Media Success Summit is your chance for online, live professional development, where pros teach you social tactics that work. It’s also a way to get caught up on a social network you’ve not mastered. Perhaps you have one or two social networks covered, but there are plenty of others you need to learn about. Or you have one aspect of a social network figured out, but want to learn how to do more with it. The Summit is very economical; it’s a lot less money than going to a physical conference. Visit SMSS16.com, study the agenda to see if it’s right for you, register, and then take your social media marketing to the next level. Learn more about Donald on his website. Listen to the Building a Story Brand podcast. Watch these three five-minute videos to help fix your website and clarify your message. Learn more about Christopher Booker, Robert McKee, and Joseph Campbell. Watch The Bourne Identity trailer. Watch problem-resolution scenes from Star Wars and The Karate Kid. Learn how serotonin seeps through your audience’s amygdala. Take a look at Apple, Chick-fil-A, and Coca-Cola. Read Good to Great by Jim Collins and Winning the Story Wars by Jonah Sachs. Watch The Hunger Games trailer. What do you think? What are your thoughts on selling with story? Please leave your comments below. Donald Miller talks with Michael Stelzner about selling with story and how to make your customer the hero.